Other photos: Port View, Bow view, Stairs to Bridge, Cockpit, Cockpit, Forward facing windows, Fordeck and sunpad, Bridge aft guest seating, TV in salon, Galley seating, Salon, Galley, Hall to staterooms, Master stateroom, Forward Vip stateroom, Guest stateroom, Engine room. One of SeaRays best selling yachts, more powerful and adventurous than any other yacht in its class, the 58 Sedan Bridge may be the last yacht you purchase! 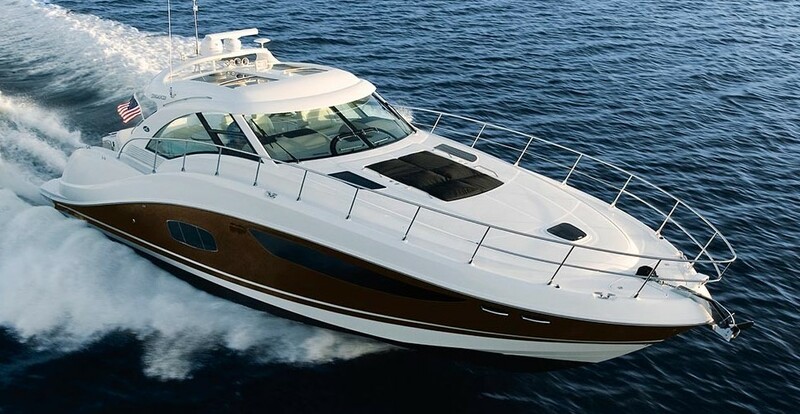 Its dynamic styling that includes a fiberglass hardtop, large cockpit and swim step, very modern hull , deck and deckhouse design, and fantastic execution, as well as the very latest in marine electronics. Driven by powerful twin MAN V8 diesel inboards, this Sedan Bridge has a higher fuel capacity than most yachts in its category, plus all the strength and engineering for the owner to explore rougher waters and new anchorages! NEW Man engines and a motivated seller make this a "Must See" yacht if you are in the market for a Sedan Bridge boat. SYS Yacht Sales is pleased to assist you in the purchase of this vessel. This boat is centrally listed by Love That Yacht.